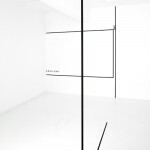 Text by Luk Lambrecht LOCUS FRAME[ D Peter Downsbrough’s (1940) work consists of a formal focus on the “location” of a sculpture/image in the contextual area of tension between the space, the architecture and the viewer. 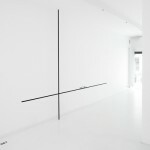 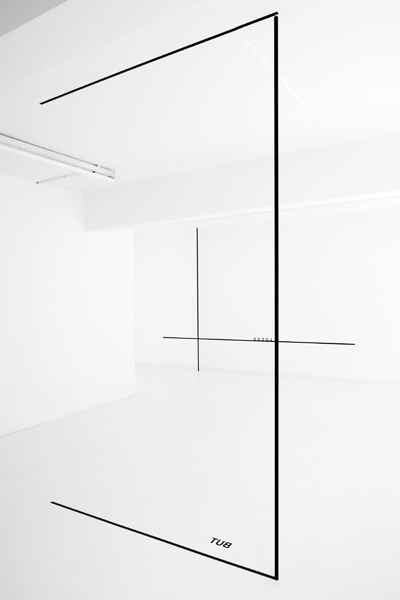 In the White-Out Studio, Peter Downsbrough restricts himself to “signifying” the space with graphic means and free-hanging pipes. 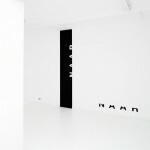 As a storefront space, White-Out Studio offers a view into how Downsbrough draws the gaze in from outside. 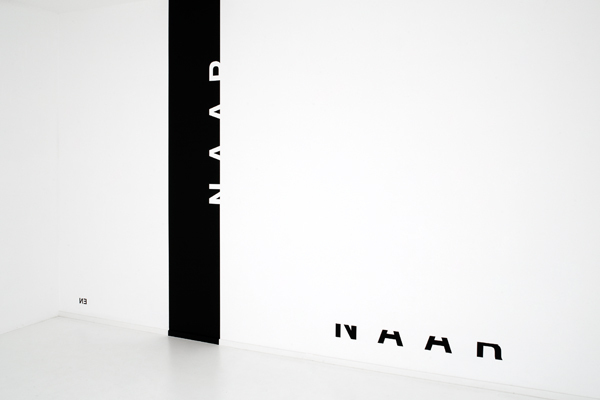 The word «HIER» is cut vertically, each half placed on one of the two windows, thus as it were opening the eye to the work in the studio. 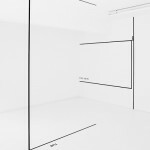 Quite often, Downsbrough’s work is compared with a three-dimensional layout in which the viewer finds/ can lose oneself on a real scale in a perfect setting of lines, “frames”, conjunctions, prepositions and words, which insinuate general visions on space. 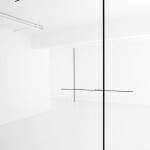 Peter Downsbrough literally frames the gaze and through a punctual and sober use of lines of black tape, free-hanging painted aluminum pipes and words in adhesive letters, he leads the spectator into a mental space marked by “positions” and directions. 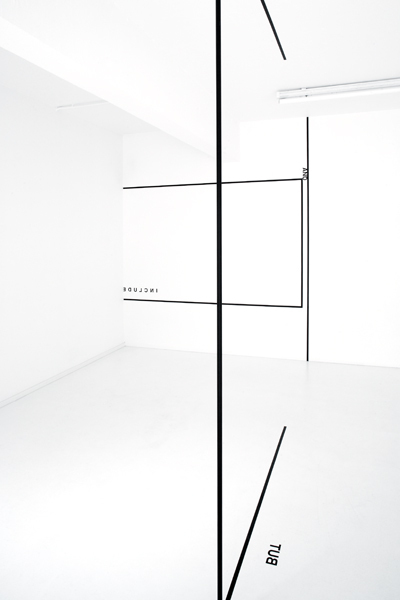 The minimal linguistics in Peter Downsbrough’s work could be compared with imaginary hyphens as a medium for the spectator to personally fill in the constructed suggestion. 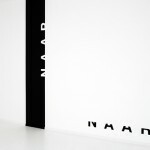 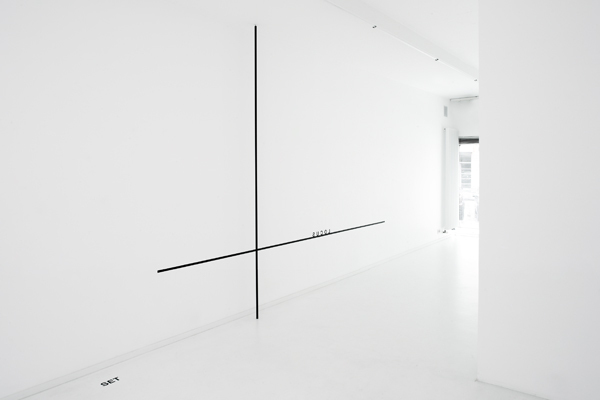 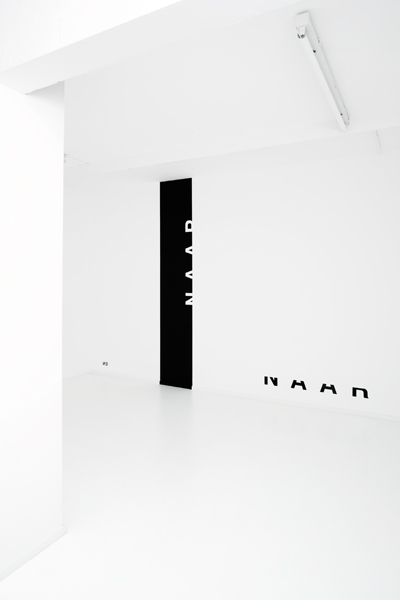 The linguistics of the exhibition in the White-Out Studio use words such as «BUT», «AS», «INCLUDED», «MAAR» and «LOCUS», executed as sculpture: splitting, dividing, and the use of positive and negative refer to « images to be sculpted in one’s thoughts». 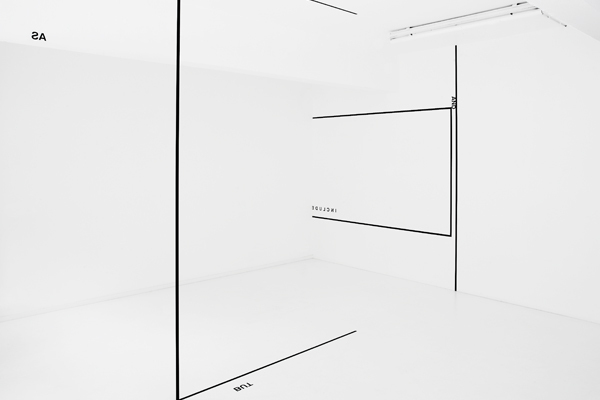 Peter Downsbrough’s project for the totally white White-Out Studio has been conceived in black and white, and so the allusion to layout becomes apparent. 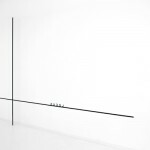 With very modest artistic means Peter Downsbrough emphasizes the core of all artistic practice, that is, placing, replacing and generating new contents in space (placement-displacement-context-content) analogous with and honing in on the changes that mark our experience of time and culture. 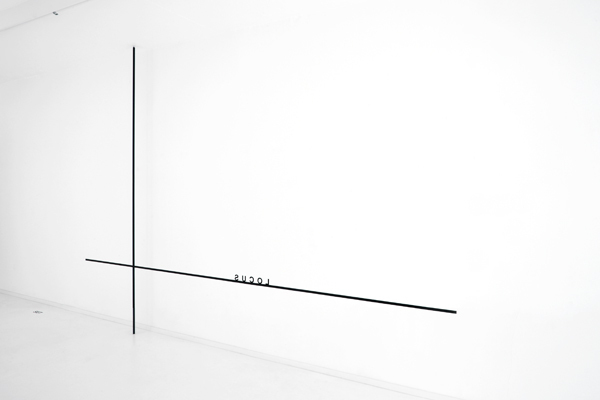 Luk Lambrecht 30 March 2006 FRAME[ D is the title of a new book published on the occasion of the exhibition.